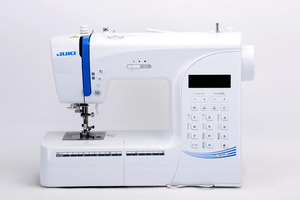 The Juki HZL-80HP Sewing Machine is loaded and weighs less than 13 pounds. 197 Built In stitches makes the Juki HZL-80HP Sewing Machine the most jam packed machine in the Juki lightweight line. The color of the Start/Stop button indicates the status of the machine. HZL-H series can sew a lock stitch at the beginning and end of sewing. There are two types of lock stitch, reverse stitch and reinforcement stitch. There are 10 types of stitch patterns, from which you can choose one by directly pushing the pattern button. Press the button to change up/down position of needle instantly. Also you can change needle stop position and can even sew a half stitch. HZL-H series sews the buttonhole automatically according to the size of the button. When sewing thin or thick fabrics, you can get comfortable feed. You can change the size of stitch patterns as well as the needle positions. HZL-80 series can sew both letters and patterns. Also you can memory letters and one unit of the pattern as you desire. Auto Needle Threader. The needle threader easily threads the needle and allows you to start sewing quickly. Reverse Stitch, Reinforcement Stitch. HZL-H series can sew a lock stitch at the beginning and end of sewing. There are two types of lock stitch, reverse stitch and reinforcement stitch. Direct Pattern Selection. There are 10 types of stitch patterns, from which you can choose one by directly pushing the pattern button. Needle Up/Down Position Button. Press the button to change up/down position of needle instantly. Also you can change needle stop position and can even sew a half stitch. Buttonhole: HZL-H series sews the buttonhole automatically according to the size of the button. Presser Foot Pressure. When sewing thin or thick fabrics, you can get comfortable feed. Visible Current Setting. You can change the size of stitch patterns as well as the needle positions. Letters and One Point Stitch Patterns: HZL-80 series can sew both letters and patterns. Also you can memory letters and one unit of the pattern as you desire. Regular Sharp or Ball Point Needles preferred?